Bassist William Parker calls BILL COLE “master of the double reed”. The term ‘double reed’ comes from playing two pieces of cane vibrating against each other. Cole’s expertise is with the nagaswarm, sona, and shenai. The South Indian nagaswarm, and the North Indian shenai, are the world’s loudest non-brass acoustic wind instruments. The sona is of Han Chinese origin. Cole is the founder of The Untempered Ensemble. 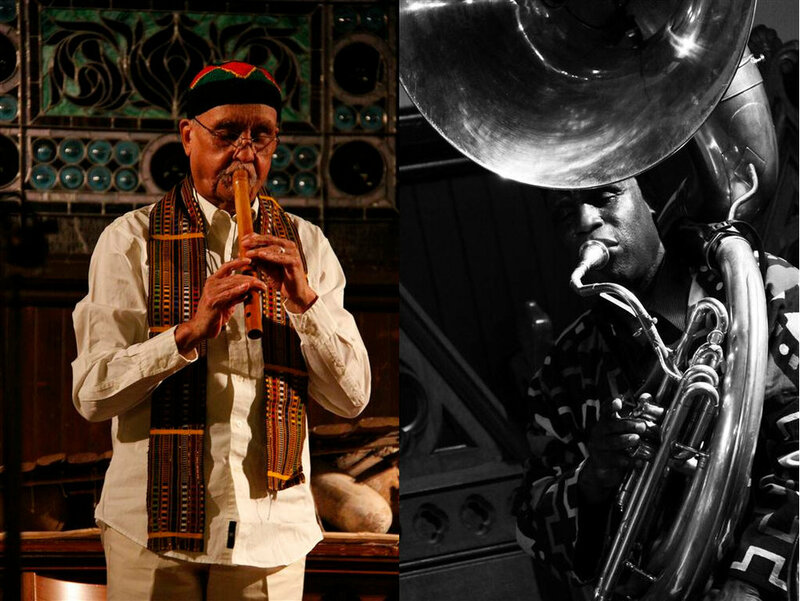 JOESEPH DALEY, a long-time co-member of Cole’s Untempered Ensemble and 40-year member on the creative music scene, has worked with artists like Sam Rivers, Carla Bley, and Charlie Haden, as well as other major artists like Muhal Richard Abrams, Jason Hwang and Dave Douglas. An original member of Howard Johnson’s groundbreaking tuba ensemble, Daley’s Earth Tones Ensemble is a full Jazz orchestra. Daley also leads his Ebony Brass Quintet. Daley also plays euphonium & valve trombone.